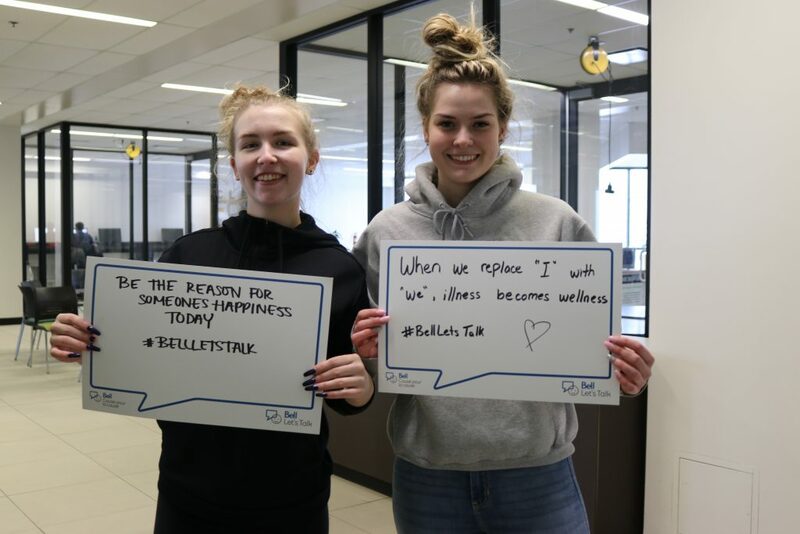 BELLEVILLE – Bell Let’s Talk mental health awareness campaign continued to grow as it had its most successful year in its nine-year history. The campaign is more important than ever, said Katie Maitland, who helped organize the Bell Let’s Talk Day booth at Loyalist College yesterday. Words of inspiration and support were added on a wall in the Link Lounge at Loyalist. They were written by students who stopped by the booth to have a conversation. The booth organizers gave out Bell Let’s Talk hats and encouraging people to share a message for others. One of those students was Taylor Lemire. “I think it’s an opportunity for people who don’t usually talk about it on a regular basis to open up about it because a lot of other people are doing it, so I think it’s pretty important,” she said. Every year the campaign has raised more money for helping to end the stigma around mental health, this being the ninth year. Abby Refausse, another student organizer of the event, says the it has improved how people look at mental health. Students that spoke to QNet News gave Positive feedback, but instead of only being aware of it one day a year, a student suggests otherwise. “Yeah this is good to bring awareness, but with the awareness has to come action, so getting out and talking to people is very important. In a way it should be an every day thing,” Chase Lavender said.